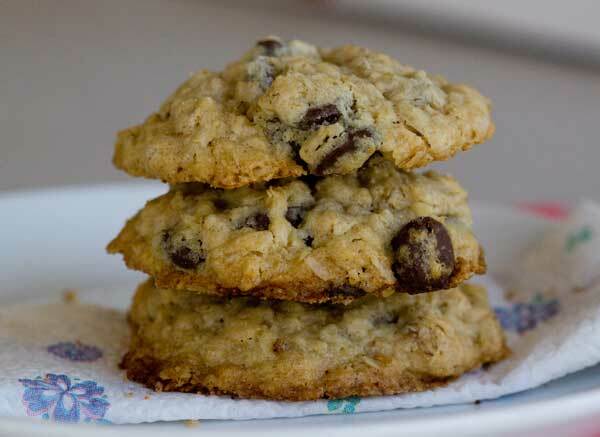 Dark Chocolate Chip Oatmeal Cookies made with old fashioned or quick cooking oats plus lots of butter. In the bowl of a stand mixer fitted with a paddle attachment, beat the cool butter until creamy. Add salt and both sugars and continue beating until smooth -- don't try to beat until fluffy or light, just smooth. Add the egg and beat just until mixed, then beat in the vanilla. Mix together the flour and the baking soda. Stir flour mixture into the egg mixture until blended. Stir in the oats and the chocolate chips. Scoop up about 32 heaping tablespoons of batter and shape into balls. Press tops of balls down slightly to make discs. Chill the balls until ready to use or bake immediately. To bake, arrange dough pieces about 2 ½ inches apart on parchment lined baking sheets. Bake for 12 to 15 minutes or until cookies appear set. Let cool for about five minutes on baking sheets, then transfer to a wire rack and let cool completely. I liked these best when they were completely cool and the chocolate chips had set. For jumbo size cookies, make 16 balls of dough and press them down slightly. Put the cookies in a 350 degree oven, but turn the heat down and bake them 1t 325 F for about 18 minutes. Since the cookies are large and fat, I used large chips. Nestle’s new dark chocolate chips are slightly larger, as are Ghirardelli’s Bittersweet. Chocolate chunks would probably be great too, but using chocolate cut into chunks may cause a little more spreading.